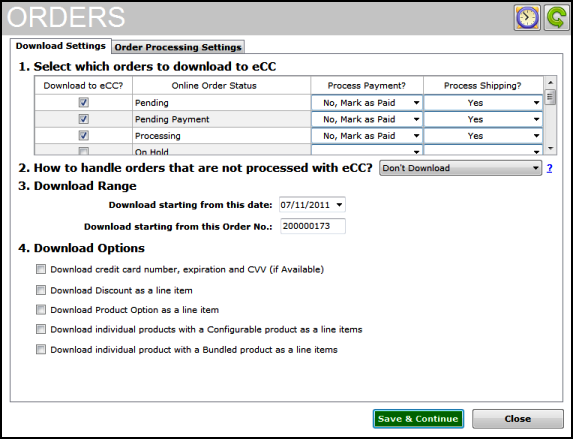 Unify Desktop downloads orders from your online store based on order status, order date and order #. Use this screen to map the order status of Unify Desktop with your Online store and specify order download settings. Use this section to map the order status of your online store with Unify Desktop order status. Select the checkbox's under Process with Unify Desktop? to specify which type of orders Unify Desktop should download from your online store. Depending on the payment and shipping status that you've specified, it will provide options to charge or ship the order. • Process Payment? : For each status where you have a checkbox, use the drop down to specify, whether orders within that status are paid for, have not been paid for, or the payment has to be processed offline. • Process Shipping? : For each status where you have a checkbox, use the drop down to specify, whether orders within that status have already been shipped or need to be shipped. 2) How to handle orders that are not processed in Unify Desktop? • This tells Unify Desktop what to do with all the orders that have not been selected to be downloaded into Unify Desktop. You can choose to not download them at all or you can choose to download them, but put them into a special ignore tab. Please remember that you cannot move orders from the Ignored orders tab into the Inbox tab. • Download starting from this date: Select the start date from which point Unify Desktop will start downloading orders. • Download starting from this Order No. : Specify the start order number from which point Unify Desktop will start downloading orders. 1) Order Processing Settings >> Post to Store Settings. • Status used when posting orders back to store: Select a status which Unify Desktop uses when posting the order back to store. Typically this would be "Completed". • Send order completion email after posting back to store? : If you check this box, Unify Desktop will trigger the email notification from your online store when posting the order back to the store (with shipment tracking details). Check your online store settings to make any changes you might require to the email notifications. You can also choose to automatically move the order to Archived Tab once posted to POS. This is especially helpful if you do not want to post orders back to store. 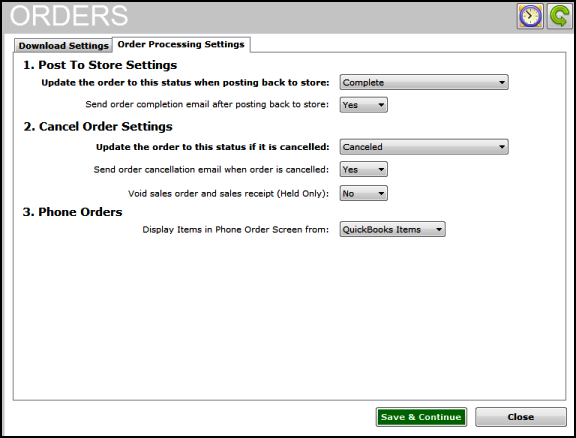 • Status used when canceling orders: Select a status which Unify Desktop uses when posting a canceled order back to the store. Typically this would be "Canceled". • Send Order cancellation email when order is canceled? : If you check this box, Unify Desktop will trigger the email notification from your online store to your customer when cancelling an order. Check your online store settings to make any changes you might require to the email notifications. • Void Sales order and Sales receipt (held only): If selected, this option will void the sales order / sales receipt (held only) when the order is canceled from Unify Desktop. The void transaction option works only with sales order (held only) and the same will delete the transaction from POS as compared to a simple 'void' in QuickBooks. • Acknowledge Orders (Only available in select shopping carts): If you check this box, Unify Desktop will acknowledge the download of orders on clicking the "Acknowledge Orders" icon on the Unify Desktop Dashboard. By Acknowledging the orders, Unify Desktop will change the status of the order to the one you have selected here. • Choose to display items in phone order screen from QB or from the online store.